I was contacted by Beth Tarson, Senior Publicist for “Rodale Trade Books” sometime late last month. 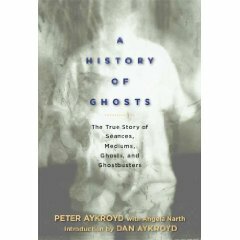 She asked if I wanted a free copy of Peter Aykroyd’s book “A History of Ghosts: The True Story of Seances, Mediums, Ghosts, and Ghostbusters” to review here on GhostTheory. Peter Aykroyd (father of actor Dan Aykroyd) has gotten together with writer Angela Narth to produce a very informative yet compact book of the Spiritualist movement that swept across during the Victoria era. Combined with personal stories of childhood memories of when Mr. Aykroyd would sit and watch seances in his family’s home, the book takes you back to the precursor of our current paranormal boom, and methodically explains where such interest came from. Written from a skeptical viewpoint (but not close-minded) the book takes you on a historical journey through what appeared to be legit paranormal encounters and the people who claimed to produce these paranormal effects, to their exposure as scam artists and their demise. The book will leave you with a better understanding of the importance of applied logic and skepticism, as well as a better understanding that science cannot explain all claims of the paranormal. The book itself was a pleasant and easy read. Taking me about a week and a half (I’m a busy guy) to finish. Most interesting is the fact that the Aykroyd family has had a long history with the paranormal. Most of you are aware that actor Dan Aykroyd wrote and starred in the Movie Ghostbusters; but many might not know that his fascination came from his father’s tales of how his great-grandfather was directly involved in the Spiritual renaissance of the late 19th century. I myself knew that Dan Aykroyd was interested in the paranormal and UFOs, but I was not aware of his families deep history. With the ease of reading, the book is perfect to use as a reference tool. 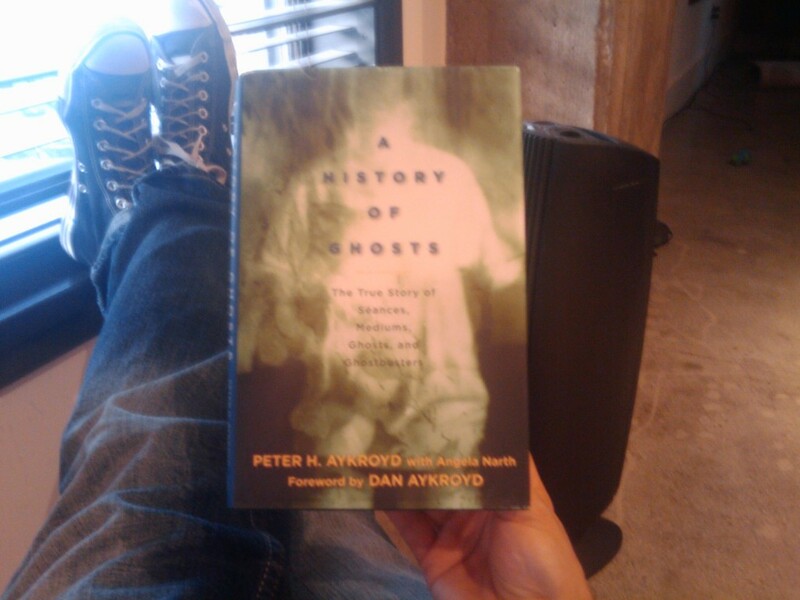 “A History of Ghosts” is a great book for believers and skeptics. When it comes to the paranormal I’m on the fence. I know there are things out there that people (including myself) have experienced, that they know could not be easily explained. Whether it’s a UFO or Shadow People, many skeptics would be quick to label it as imagination running wild, or strong electromagnetic currents affecting the brain’s wave patterns and create hallucinations. In this book, Mr. Aykroyd catalogs how such beliefs came to be, and from a well deserved standpoint. Through the boom of Spiritualism, interest in the paranormal grew bigger and bigger but at the same time it also grew less credible. Almost all of the seances, trances, mediums, psychics and ghosts were done to deceive the public and rob them blind. Because of that, skepticism gained more power. If you are a believer in ghosts or if you are a believer in science and a die-hard skeptic, this book is covered with facts that can help you explain your argument better. Whether talking amongst friends or having a scholarly debate in front of hundreds, the facts presented here are well written and recorded and can be used to propagate your viewpoint. I really recommend this book, especially to those who are investigators and writers of the paranormal. Always have the facts and know the history of what you are defending. Thanks for the review. I might have to get this. I’m extremely interested in the history of Spiritualism. Cool, my copy is inbound from Beth, can’t wait to read it! Spiritualism (or the movement) was a real crazy thing. Many frauds were busted. Many people were swindled out of money. I always like to hear about the hoaxes and people behind them. You’ll get a kick when you read on “ectoplasma”. Cool. Let me know if you like it. I think it’s a good reference to have in your library. Dan Aykroyd does have quite a fascination with UFO’s and was involved with another website last I knew. I wasn’t aware of his involvement with the paranormal though. Growing up with the family legend/history was what inspired him to read up on the paranormal and eventually incorporate that in his acting career. I know Dan Aykroyd’s brother, Peter, produced “PSI factor” TV show. Rockin’ the Chuck Taylors. Nice. Way cool, Javier! I was excited to read it before, but now after reading your review of it I’m REALLY excited! I love learning about things from what I call the First Renaissance of Spiritualism. (Back during the turn of the 20th Century.) I find it curious that at the turn of the 21st Century it’s enjoying a revival. Thank you so much for stopping by my blog and turning me on to your review!